At Mr Farmer workwear we recognise our responsibility to manage the direct and indirect environmental impact of our day-to-day operations. We therefore strive to adopting and managing the best practice wherever possible, to minimise the environmental impacts of our activities by choosing alternatives that protect and improve the environment. Ensure that environmental responsibilities are understood by all staff. Promote reduce, reuse and recycling consciousness. Minimise any potential impact in our working environment with regards to heating and cooling energy requirements. Associate with suppliers that share the same environmental policies. Efficient and environment-conscious ordering of materials to reduce the impact deliveries. Use electronic method of communication and administration to avoid the use of paper wherever possible. Efficient and environment-conscious delivery of orders to reduce the environmental impact of our services. Promote and encourage our customers to keep any potential impact on the environment to a minimum. At Mr Farmer workwear we are committed to providing and maintaining a safe and satisfying working environment for employees, customers, guests and members of the general public. Hazards and risks to health and safety are eliminated or minimised, as so much as is reasonably practicable. Our owner, directors, managers and employees all share important responsibilities and are committed to complying with the Occupational Health and Safety Act, 1993. Ensure the business complies with all legislation regarding health and safety. Promote safe working practices are developed and implemented. Consult with and involve workers on matters relating to health, safety and wellbeing. Identify hazards and take to take measures to control or eliminate as much as is reasonably practicable. Share information, instructions and training to enable all workers to work safely. Supervise employees to make sure work activities are performed safely. Provide, where required, protective clothing, safety equipment and appropriate warning signs. Adhere to the employer’s health and safety policies. Report health and safety hazards. Report all injuries and incidents. Make proper use of any personal and protective equipment. 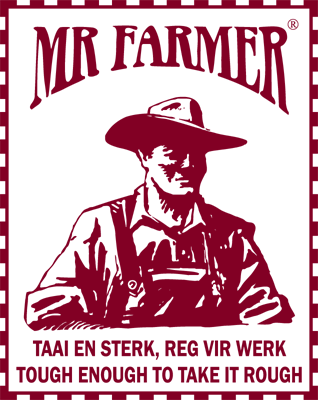 At Mr Farmer workwear we recognise our responsibility to contribute positively to the communities in which we operate. Our community investment is funded through an annual budget intended to help and support organisations and people in need by means of direct funding and donations. Continuously seek for and support local charities and community projects to which we can add value. Create awareness by sharing information about local charities and community projects on our online platforms. Encourage and support charitable giving and volunteering participation from our employees. Act with integrity and ethical standards. This will only be achieved through the participation, co-operation and commitment of everyone in the workplace.